NPA chairman Richard Lister has described an anti-pig farming advert by vegan campaign group Viva! as 'totally misleading'. The NPA has reported the UK's first vegan cinema advert, which claims that 90% of pigs are factory farmed, to the Advertising Standards Authority. "It's totally misleading," Richard told the Daily Telegraph. "The UK pig industry is rightfully proud of its welfare, it's got the highest level of welfare in the world, in excess of 90 per cent of the pigs belong to the Red Tractor assurance scheme." Viva! hopes its advert, titled Hope and Hell' will reach 2.25m people. Crowdfunded by the it supporters, who raised more than £102,000 to fund it, its run began on December 1 and is due to end on January 4. It is being shown ahead of films including Star Wars and Murder On The Orient Express. Contrary to being dominated by factory farms, the UK pig sector is, in fact, one of the most diverse in the world, with even its largest indoor farms nowhere near on the scale of the some of the units found elsewhere in the world, for example, in the US. A combination of EU and UK legislation and schemes like Red Tractor ensure our standards our world leading. For example, the UK banned sow stalls in 1999, around 15 years ahead of the rest of the EU, while the systems are still commonplace in the US, Canada, Brazil and many other countries. 40% of weaners, 60% of growers and 45% of finishers are kept on straw indoors, with the rest kept on indoor slatted floors. This range of systems is virtually unique with most major EU countries primarily raising pigs indoors in slatted systems. 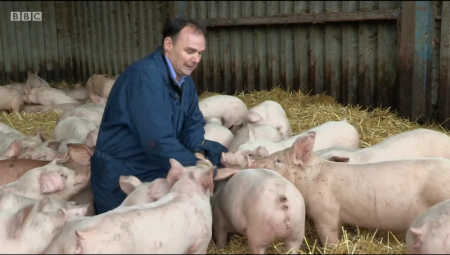 Richard said: "The UK pig industry is incredibly proud of its high welfare standards. The point is that, whatever the size and systems of our farms, farmers take welfare very seriously and deliver very high standards. "We urge the public to see through this misleading propaganda. There are very much two sides to this story." Viva! claimed its figures showed a true representation of the British pig industry.